Finn has a problem. Three years ago, his mother was killed in a car crash, and since then, his father has been "parentally missing in action." This has made Finn responsible for taking good enough care of his little sister, Erin, that she doesn't get taken away by Child Protective Services. Since Finn is even now only fourteen, this has been a heavy burden, but he loves his sister and has to do it to hold together what family he still has. Now his father has moved them from sunny California to less-sunny England, and Finn has to be the new kid in school and learn a whole new culture, while continuing to care for his sister. So it's a bit inconvenient when a faery named Zaneyr steals his body and sends his soul into the Otherworld. 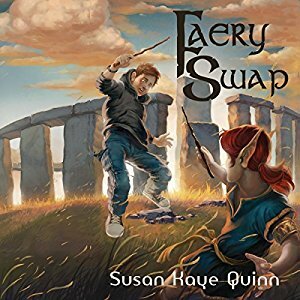 In fairness to Zaneyr, he thinks he's doing the only thing he can: escaping his father's mad, dangerous plan to re-fuse the Otherworld and Earth together again, so that the faery will have real lives again. Too bad so many human souls, now only trapped in the Otherworld, would be completely destroyed in the process! Finn just wants to get home to Erin, and has no idea how hard that is. Zaneyr has not fully though through what his own plan to stop his father will really do, starting with the fact that he'll be stranding yet another human soul in the Otherworld. He's also assuming that his father won't go ahead and try to complete the Fusion without Zaneyr. There's also something really important that both Finn and Zaneyr don't know about Finn's father. Finn, Zaneyr, and their allies and opponents keep making big mistakes while trying to single-handedly fixing the major problem Zaneyr's father created a year ago in the Otherwold, a century ago in Finn's world. It's a fun book, with some interesting twists and turns.